An old friend of mine is a lifelong Episcopalian, active in his church, faithful to God, eager to share his gifts for the common good. My friend is a university professor, has written several books and has had the ear of a few Presidents. My friend has, what we sometimes refer to as “influence”. My friend’s academic research focuses on evaluating government programs designed to assist the poorest of the poor citizens in his country. So it’s not surprising that the Episcopal Church he chose to attend was a faith community with a diverse demographic. The congregation is located in an urban area with a high rate of poverty. It will come as no surprise to you that this church has a foodbank. The Apostle Paul is credited with more books in the New Testament than any other Biblical figure. Paul’s conversion experience and his evangelical zeal connected him to countless churches spread out in his large region. James Boyce, Professor of New Testament at Luther Seminary has this to say about this particular faith community in Corinth. This was a “charismatic” community, defined by the exercise of various gifts: speaking in tongues, healing, prophecy, etc. The Corinthians took pride in their gifts to the point of one-upmanship. The leadership of the community must have felt threatened, for the Corinthians were splintering into groups with their own rivaling leaders. As you have heard me assert many times central to Paul’s theology is the doctrine of grace, that God loves us unconditionally, that God calls us into existence, God gifts us for relationship and God focuses our efforts on a common good, that is a shared sense of community, what makes us whole and brings out the best in all of us. The sign of this faithfulness is the assurance of the Spirit’s active presence in all persons and community and, no matter what their fears and particular evidences to the contrary, as ones called into this community we are not lacking in any gift that the Spirit has to offer. The guiding principle, in the form of a Pauline mantra, is confidence that with the Spirit’s gifts comes the wisdom to understand and the ability to work for that which “builds up the community. “All things are lawful; but not all things are helpful” (6:12; 10:23). Consideration of these two verses together underscores that for Paul “what is beneficial,” “what builds up,” and living in the “freedom” of “all things being lawful” are mutually interdependent realities. When considering God’s gifts, Paul says, we always need to begin by getting one thing straight. The central “gift” of the Spirit is our common confession that Jesus Christ is Lord. This confession, empowered by the event of the cross and resurrection, binds this community and all Christian communities together in a unity that overarches all our differences. This central idea is the purest form of freedom, it releases us from our fears and anxieties, if Jesus can die in his witness, sharing his gifts, affirming others’ gifts, and be resurrected to new life surely there is nothing that can prevent our God from using our gifts for the common good. Circumstances may look bleak, our gifts may appear to be exercised with no immediate results in the offing but our God will redeem our sacred offering, our God will prevail and our gifts will rebuild and renew and refresh. “The common good” (12:7) is given with particularity and with purpose “for the common good.” Of course that “common good” is not always transparent; it has to be negotiated in practice, again by the use of the gift of wisdom, in consideration of what it is that “builds up the community.” Paul argued against notion of their narrow notion of “grassroots” leadership. Instead, he argued for the big picture. For Paul, God was in charge. This was Paul’s cultural presumption. The Jewish notion of Creation could be simply stated that all things came from God, so they would return to God. To address the question of how to organize these various gifts of the Spirit Paul tried to make a cultural accommodation to the Greek community. The highest virtue in the Greek world was wisdom, the ability to make clear and correct judgments. Such a virtue was higher than knowledge, for it guided the person to seek the right knowledge. Both wisdom and knowledge led to firm faith. The rest of the gifts were based upon spiritual power and the needs within the community. So back to my friend in the Episcopal Church, he wanted to offer his spiritual gifts, which he would describe as macro planning, the ability to imagine ways to move people to better outcomes. Instead of this kind of gift sharing this disciple felt he was wasting his talents by bagging groceries and sorting food donations. At a critical point my friend began exploring other Episcopal Churches, ones where he felt that the other members were more like him, would value his unique gifts, where he might be more effective. He told me there was a critical moment when he became aware of that “still small voice” of the Spirit, that told him to contact the church leadership team at his home church and tell them about his dilemma. With some reflection and conversation this church and my friend came to a “wise” understanding that 1) bagging groceries was in fact a spiritual gift, a gift of labour and a gift of humility and 2) there ought to be other ways for my friend to exercise his discipleship but it was important that his gift be “tested” by the quest for a “common good”. In other words, it was important that my academic friend find a way to partner with others in the church so together they could meet a need in their community. The small team my friend assembled reached out to the church and the community and asked what was needed and what they heard was job training, personal support and personal development. And so my friend and his team began to implement a program to meet this need, to help the church offer something that might change lives, build people up, improve the common good of the community. It worked. All members of this small team offered different spiritual gifts but it was the gift of wisdom that helped the community, helped my friend, to be reminded about the “common good”. All gifts belong to God and exist for God’s purpose. 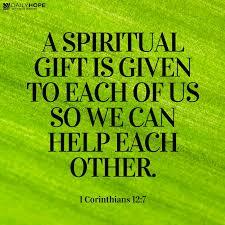 Each of us has many spiritual gifts that come from our Creator and they exist for the very purposes of our Creator. What a joy to know we have these gifts, to know what they are for, to know in our Easter faith that God will use these gifts to redeem our broken world. Thanks be to God for this deep and wise understanding. Together we can and we do live this vision into life. Amen.